The diagonal compact modules were specifically developed to dissipate thermal loads in control cabinets while working as efficiently and quietly as possible. Tubeaxial fans are commonly used in these types of applications; however, the new diagonal compact models provide a more optimized solution. 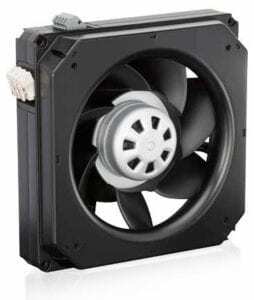 Available options include AC 115 V 60 Hz and 230 V 50 Hz, as well as with a GreenTech® EC motor for 115 V and 230 V operation. Technology: The innovative diagonal impeller combines the positive features of axial and centrifugal blade designs. Operating optimally in the medium pressure range, benefits include pressure insensitivity (even with increasing pressure loss) while simultaneously offering high efficiency and a low sound level. The running noise is much lower than that of commercially available tubeaxial fans, and the diagonal outflow produces a more uniform flow through the control cabinet which significantly reduces the formation of harmful “hot spots” and therefore extends service life.